I've been having a really hard time figuring out how to write this review because every time I try to talk about the main character, I don't know which gender binary pronoun to use. But I think that's the point -- to feel this sense of cognitive dissonance at having to move beyond established paradigms. And the author does an amazing job at keeping you wondering through the entire book as to the gender that society would assign to Riley Cavanaugh. I thoroughly enjoyed Symptoms of Being Human. Jeff Garvin does a wonderful job of helping the reader get behind Riley's plight as many young readers are likely to have never heard of the concept of gender fluidity. But because the author surely knows so many people haven't heard of this issue before, there were places in the story that felt more like it was trying to be an educational pamphlet than a young adult novel. I certainly don't fault Jeff Garvin for that, but at the same time, it made the story feel a bit like an after school special in places. That doesn't make the book any less compelling; it just made the narrative a little bit more noticeable at the seams. 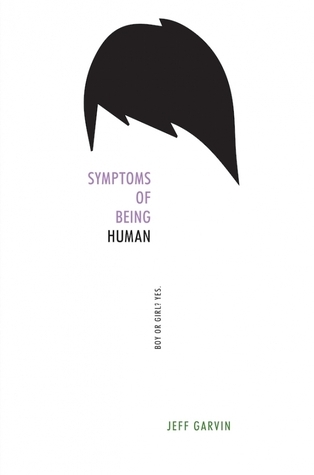 Even so, the writing in Symptoms of Being Human is both precise and poetic. Riley doesn't mince words, but still manages to write with a sense of wonder and appreciation at the power they hold. If you're looking to add to your collection of YA novels with compelling LGBTQ characters, I highly recommend Jeff Garvin's debut novel. Pronouns are starting to be a real problem sometimes these days! I'm personally in favour of "they" as a gender-neutral singular, since we use it often in speech, but I know a lot of people object to it. I enjoyed the experience of reading the Ancillary books, in which the only pronoun used is "she," so you never really know anyone's gender. It's weird for a while, and then you get used to it and stop worrying about what gender everyone is, and that's a little mind-blowing! This sounds like an interesting read. I love the way you describe the narration as "noticeable at the seams": what a great way to describe when the writing pulls you out of the story.